Night comes slowly during the summer. During late June and early July, the sun doesn't set until 9:20 pm and twilight doesn't end until 11:30 pm! This can be difficult for stargazers that have to work the next morning. The summer night sky is well worth staying up for though. The Milky Way, a faint band of light made up of innumerable stars, arcs across the sky. If bright lights are nearby, from a large city or your neighbor's yard, the Milky Way may be invisible. From a dark sky site, the Milky Way will make a lasting impression on you. After all, what you see is your home galaxy overhead. On a clear, moonless night find an observing site with a dark southern sky. The "central bulge" of our galaxy will be in the south at about midnight during early summer. Make sure you're well prepared before you venture under the stars. Pack a cool drink, insect spray, a flashlight (with red light), a star chart, and a pair of binoculars. Yes, that's right - binoculars! You'll be amazed with what you can see through a pair of 7×50 or 10×50 binoculars. Binoculars are the ultimate tool for scanning the Milky Way's rich star clusters and glowing nebulae (clouds) of dust and gas. Scorpius "the Scorpion" is one of the most recognizable constellations and is due south at midnight during early summer. The most notable star in this constellation is the red supergiant Antares, which means "rival of Ares", the ancient Greek god of war (Mars in Roman mythology). To the west of Antares, a nearly vertical line of three stars forms the head of the scorpion. The scorpion's tail forms a hook that skims just above the treetops. The tip of the hook forms the scorpion's deadly stinger. Scorpius as seen from a very dark location in West Texas. Point your binoculars at Antares and then move the red giant to the upper left of your field-of-view. Look for a small ball of light; this is the globular cluster M4, a collection of tens of thousands of stars 7000 light-years away. Through a telescope M4 is astonishing, more stars than you could possibly count in one night. Next, follow the tail stars until you come to Mu Scorpii, a lovely double star. Move slightly south of Mu and you're sure to stumble across NGC 6231, a collection of 30 stars. This entire region is packed with stars from lesser clusters. 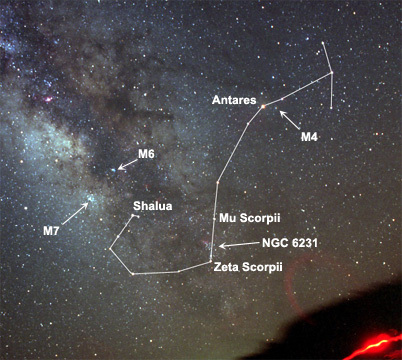 Just below NGC 6231 is another double star, Zeta Scorpii. Follow the tail all the way to the stinger star, Shaula, and then pan to the east. The magnificent open cluster M7 will nearly fill your field-of-view. Over a dozen blue and white stars are visible; several concentrated in the cluster's center with several more in the outer boundaries. With M7 in the center of your field, slowly pan to the northwest and you'll come across M6, another open cluster. It's smaller than M7, but still a delightful sight in binoculars. See if you can place both clusters in your binoculars' field-of-view. Open clusters M6 (right of center) and M7 (below center). I leave the rest of the Milky Way's summer delights to you. 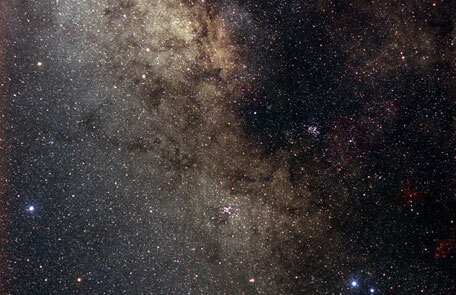 Follow the Milky Way from Scorpius in the south to "W" shaped Cassiopeia in the northeast. You're sure to discover several of our galaxies secret places along the way.